Anthraquinone glycosides ~Rhei extract) 500mg. and protects the ulcerated area of oral nlJcous membrane and enables healing to occur. 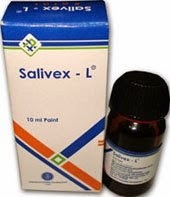 Salivex-L leads to a prompt decongestion of inflamed mouth lesions, reducing secretion and hypersensitivity of rt , It is well tolerated even by ~ who are hypersensitive to iodine and easily to be applied without causing any sort of pain. - يستعمل كعلاج مساعد فى ألتهاب البلعوم. – Acute and chronic inflammations of mucous membranes of mouth and throat. – Teething troubles …. etc. Hypersensitivity reactions to the drug components are very rare. - تجنب غسيل الفم مباشرة بعد استعمال الدهان. - يجب غلق الزجاجة جيدا بعد الاستعمال. التى تحتوى على مخدر مو ضعي تؤثر على عملية البلع. لخاصة بالنسبة للاطفال. – Avoid rinsing the mouth immediately after application. – The bottle should be carefully closed afler use. – When topical anesthetics are used in mouth or throat, the patient should be aware that the production of topical anesthesia may impair swallowing, for this reason, food should not be ingasted for 60 minutes,Jollowing the use, this is particularly important in children. Salivex-L. Avoid rinsing the mouth immediately after application.